Ray-Ban has played a pivotal role in forging the meteoric rise of celebrity culture owing to its constant technological developments to create eyewear that are simply fashionable. From time to time, the culture icons have flaunted the stylish Ray-Ban eyewear on various occasions. These include the likes of James Dean, Audrey Hepburn, Kate Hudson, Jessica Alba and many more. For icons who want to be seen, designs by Ray-Ban have always been an indispensable accessory. One such design is the revolutionary Aviator series that is known to have helped Ray-Ban race towards the position that it commands till today; as visionary leaders in style and innovation. It is these traits that have led to the brand leaving an indelible mark on the culture history. The history of this brand is a history of a forcible rise. Fame and success are two conceptions that have been accompanying Ray-Ban for almost eight decades. It all started in 1937 when Ray-Ban was founded by the American company Bausch & Lomb. Today, Ray-Ban is widely associated with two popular eyewear models that have perpetuated the brand: Aviators and Wayfarers. If Aviator is a direct synonym to fame, Wayfarer has in turn earned its recognition as a symbol of success. Aviator, the iconic model that continues to be one of the top sellers for the brand even today, owes its origins to a problem that was bothering American pilots for quite some time. With the evolution of technology, new airplanes came into existence. And as the new pilots were allowed to fly farther and higher, they began to complain about the glare from the sun blocking their vision, giving them headaches and altitude sickness. As a solution to this problem, a new kind of glasses was introduced with green lenses that could cut out the glare without obscuring vision. And so the brand Ray-Ban was born. While the popularity of the brand is due to its consistent appearance in many movies, to associate its success only to Hollywood would be wrong. After all, the American army had been buying and popularising its products long before the brand got its share of space on the big screen. In fact, the name Aviators also owes its origin to this situation. Every teenager, youth and man wanted to look sternly and cool, and Aviator eyewear was the best accessory to realise this dream. One of the first and long term admirers of this style was General Douglas MacArthur. The overwhelming success of Ray-Ban is closely connected with Hollywood, though saying that the film industry marked the beginning of its stunning success would be wrong and unfair. The anti-glare lens went on sale in 1937 and ever since, the brand has grown considerably coming out with new collection year after year. Ever since the introduction of the iconic aviators in 1937, the brand introduced several impressive designs that won hearts. Research and development propelled the introduction of even bigger innovations in Ray-Ban eyewear. For instance, the Ray-Ban Signet sunglasses that features an eye catching gold or silver frame with horizontal bands at the nose bridge, front corners, and ear stems was launched around this time. The original Ray-Ban Signet was later revamped to present many other iconic designs. This include the 2011 Ray-Ban Johnny Marr’s Limited Edition that was customised by the guitarist for the legendary British indie rock band ‘The Smiths’. Other innovations of the 1950s includes the G-15 grey lens (1953) – a neutral grey lens claiming to give true colour vision even in most dazzling glare – and a fourth metal frame style, the Ray-Ban Caravan (1957), a squarer version of the Ray-Ban Aviator, later worn by Robert De Niro in 1976s popular movie Taxi Driver. 1956 became a turning point in the brand’s history signifying the launch of Wayfarer. The absolutely new model shot to fame due to its unusual design and plastic frame that impressed people. Wayfarer is estimated to be one of the most successful eyewear models in Ray-Ban’s long history, according to their sales data. Later on in 1982 Ray-Ban went on to become an inalienable part of the movie industry. The iconic designs appeared in cult movies like ‘Breakfast at Tiffany’s’, ‘Risky Business’, ‘Moonlighting’ and ‘Top Gun’. Audrey Hepburn, Tom Cruise, Bruce Willis and many other wore Ray-Ban Clubmaster, Wayfarer and Aviator designs. This led to the eyewear escalating to the status of a fashion icon in a short span of time. There’s no denying the fact that success doesn’t last forever, and sometimes even the best companies have to go through a crisis. Ray-Ban is no exception to this phase. In 1990s the sales went down and Ray-Ban was bought over by Italian conglomerate Luxottica. 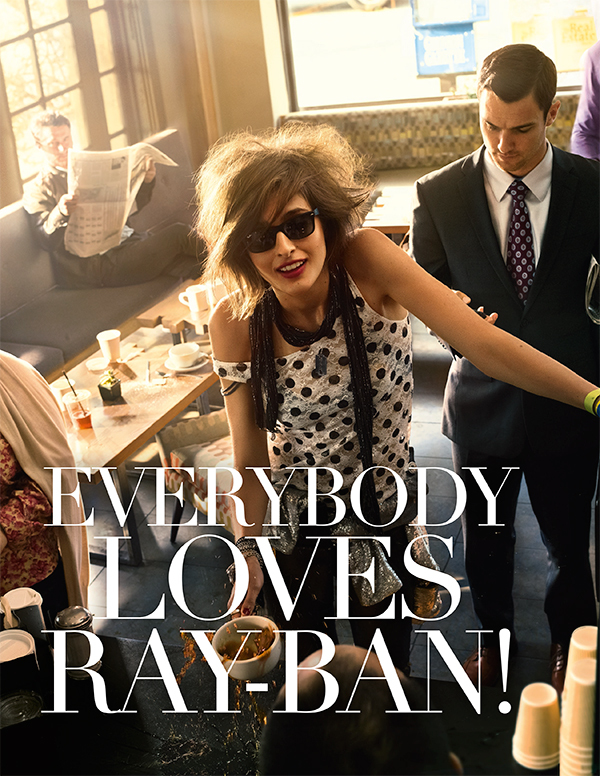 Under the Italian supervision, Ray-Ban went on to become an international brand. It still preserves its cinematic image and continues to be a celebrity favourite. Starting 2003, Ray-Ban expanded in a big way starting with Ray-Ban Optical for prescription lenses and Ray-Ban Junior for children. While Ray-Ban Optical is inspired by the brand’s pop culture heritage and meticulous craftsmanship, the junior collection is exclusively for kids. Ray-Ban Junior focuses on maximum eye protection while providing stylish, comfortable frames. Come 2005, the Ray-Ban Junior category expanded further to include models made entirely from titanium for a hypoallergenic and lightweight yet sturdy option. In 2007, Ray-Ban launched the NEVER HIDE campaign, an innovative global media plan highlighting Ray-Ban’s unique ability to place its wearer in a timeless cool statement. NEVER HIDE kicked off with an interactive project at NYC’s Times Square featuring 12 screens displaying images submitted by Ray-Ban wearers, all of whom were asked to express themselves spontaneously. Gradually, NEVER HIDE went on to become an international phenomenon. People from all over the world participated and Ray-Ban’s popularity grew stronger. Even today, the campaign continues to be remembered as one of the most successful marketing initiatives by the brand. With each passing year, Ray-Ban has successfully adapted, evolved and improved its offerings to meet the diverse set of customer demands. When it seems that nothing can be done better, Ray-Ban succeeds in surprising fashion-connoisseurs over and over again, contriving improved eyewear frames, thinner glasses, more delectable decorations and new functional features. In its eight decades old legacy, Ray-Ban has come up with various iconic collections, each of which highlight a combination of tradition and innovations, boldness and elegance, laconism and expression. Clearly, the detailing allows the brand to cater to the most demanding customers as well. Thanks to the astounding design, Ray-Ban Clubmaster eyewear has become a compulsory attribute for men who are keen to pursue a stylish way of living. Moreover, because of the growing popularity of youth culture, the attention to vintage and retro accessories has become higher than ever. And so the 65 years old design continues to be popular even today. Active, another eyewear collection distinguished by its light nylon frame and wide range of polarised lenses were created for those whose urban life is high on the fashion quotient. Inspired by the idea to act now, this eyewear has a large fan following among Ray-Ban users. One of the most recognisable models, Caravan, was also introduced in its revamped version. Its gilt frame with grey or green gradient lenses guarantee the best known protection from rays of the sun and the model is extremely stylish. Liteforce is also another excellent example of tenacious sunglasses, ideal for those who want to sport a confident style statement. They are lightweight and yet durable. The Ray-Ban Fall/Winter 2016 collection focuses on contemporary details and modern lens variations for a fresh new perspective on unmistakable designs. Always striving to live up to the pioneering spirit of Ray-Ban, the collection underlines the brand’s unparalleled ability when it comes to pushing the limits – presenting revolutionary lenses and innovative features to redefine the essence of authentic style and enhanced performance. Never just a transient trend, Ray-Ban eyewear works as an accessory that adds a statement of individualism to a person’s style statement. No wonder, eight decades after the first pairs of Ray-Ban aviators helped American pilots fly higher, the brand still continues to remain an enduring classic.